We’re building a team of forward-thinking professionals who want to be on the cutting edge of the industry. Grow your career with the company that is changing it all. Free & Exclusive to you... And did we mention free? We believe in a simple formula: Hire top-notch people. Train and support them. And provide all the latest tools and technology. Our culture is reflective of this philosophy – our branding and marketing is designed for today’s consumer, we encourage collaboration, and celebrate the unique strengths and talents of our agents. Teamwork is promoted, as it is our belief that when we work together we can accomplish so much more! Cutting-edge technology, support & training, and teamwork mean that NextHome Coastal agents have a better, balanced life. It is just that simple. In 2007, business partners and friends, Marlene Waterhouse and Tina Hartman opened Short Sale Solutions, providing short sale expertise and services to hundreds of agents, buyers, and sellers. In 2013, the partners opened their own brokerage. Holding true to their “family first” ethos, Marlene and Tina designed a brokerage that ensures not only professional success through extraordinary client service, but also allows each team member personal balance, development, and growth. As NextHome Coastal, Tina and Marlene, along with their seasoned team of agents and support staff, are thrilled to serve the booming Orange County area! We support the on-the-go agent with a multitude of mobile resources. Our agents are fully equipped to meet their client’s needs anywhere! Yet when it is time to meet a client, make a few phone calls, or prepare a presentation, we also offer an office that is lean, efficient and productive with a great work environment and culture. Our in-office resources include workstations, a printing and material creation station, a conference room for private meetings, and a plush lounge for casual get-togethers. The design is fresh, clean and modern. And meeting clients here will speak volumes about you and your real estate business. 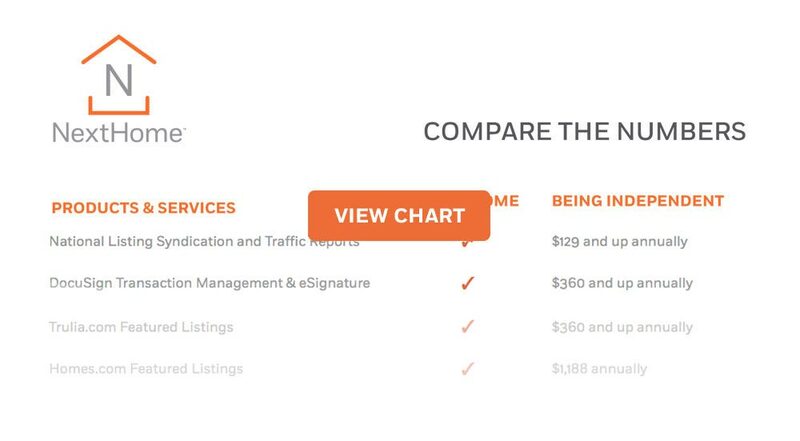 Our agent’s return on investment, along with superior technology, lower royalty and service fees, vendor selections, and other services are all designed to substantially drive down the costs for agents to pursue their careers. Aside from referrals, in many cases, buyers and sellers find their prospective agents online. That is where you should be to greet them. Our programs assure agents a strong social media presence to ensure they are found. Our Agent Fee Structure is as simple as you can get. We offer two models: a monthly flat rate fee, or a gross commission income fee, with the ability to change plans every six months. In either case, there are no surprises. And never any desk, office, E&O, or any other fees. Period. Life is on the move and real estate happens everywhere. Transact, market, and execute your business anywhere, anytime. And to make it even easier, our technology, advertising, marketing and training are all integrated … and part of the package. Experience a comprehensive platform and full set of easy–to-use services all in one place. When you join us, we provide you with your first order of company business cards as well as your first sign. We are stronger together. Be a market and prospecting expert by sharing ideas, trying new practices and staying current for a thriving business tomorrow. Knowledge is power and essential to your success. Weekly trainings and education sessions are accessible both in-office and remotely. In addition there are online training videos, webinars and publications to improve your abilities and increase your income. And for brand new agents, we offer a mentoring program to develop the knowledge and confidence before you go off on your own. Our leads are generated from a variety of sources that we provide, including our website, the Featured Listings program, Mobile Connect, Reach150, real estate property website profiles, social media, and local marketing tailored to Orange County. We are about providing quality leads, not quantity or time-consuming leads. At NextHome Coastal, fees are kept low. There are no desk fees, no E&O fees, no broker review fees, no website fees, no technology fee. The franchise fee is flexible and is charged at a low flat per-month charge or on a per transaction basis. You can change the way the fee is paid every six months. Why change plans you ask? One common reason is seasonal. During the slower winter season, our agents can choose the percentage option. Then when the spring market arrives, agents can switch to the flat rate option. And for our brand new agents, the percentage option allows them to build their businesses without the monthly fee until they sell their first home. It’s great to have options, isn’t it? An inside look at the NextHome difference. We share how our model is all-inclusive, and show you the products, services, tools, technology and more that will give you the edge to grow local marketshare. The administrative genius and heart of every NextHome Coastal transaction. Ensures homes close, and customers are wowed. The business generators and key that starts every transaction at NextHome Coastal. The initial contact person for each client and partner of the company. Coffee is for closers. The customer facing engine that drives all home sales and purchases at NextHome Coastal. What could be better than Creating The American Dream on a daily basis? Join us for a FREE real estate training event for agents on November 22, 2016. The topic is Marketing Planning that WORKS. Seats are limited so please RSVP BELOW. See you there! Join us for a free training event. Seats are limited so please RSVP BELOW. See you there! Made with in Orange County, California. Each office is independently owned and operated. Servicing Orange County, CA.